New this year, a special video bonus! Once each year, we empty our closets – as it were – and give our Caps sweaters and other assorted jerseys a good wash, whether they need it or not. Actually, they always need it. Traditionally this happens just before the start of NHL season play, giving us a good chance to wash all of last year’s frustrations, desperation, tear stains, Dippin’ Dots schmutz and mustard down the drain. That said, being good gays, we’re uncomfortable with just chucking them in the tub, tossing in some Fab and hoping for the best. Will our Brooksie autograph fade? Will our Nicky sweater start to fray? And just how are you supposed to get mustard out? Taking a cue from two-time Pulitzer prize winner (apparently they were really, really high) Gene Weingarten of the Washington Post, we gave Reebok Customer Service a call and spoke with Erin about proper care and washing tips. The transcript follows. [Reminder: Add the disclaimer about this being fiction or Reebok will sue the crap out of us]. Erin: Thanks for calling Reebok. This is Erin, how can I help you? PB’s: Hi Erin. We have a Green jersey, which we love, but it kept getting damaged a lot. 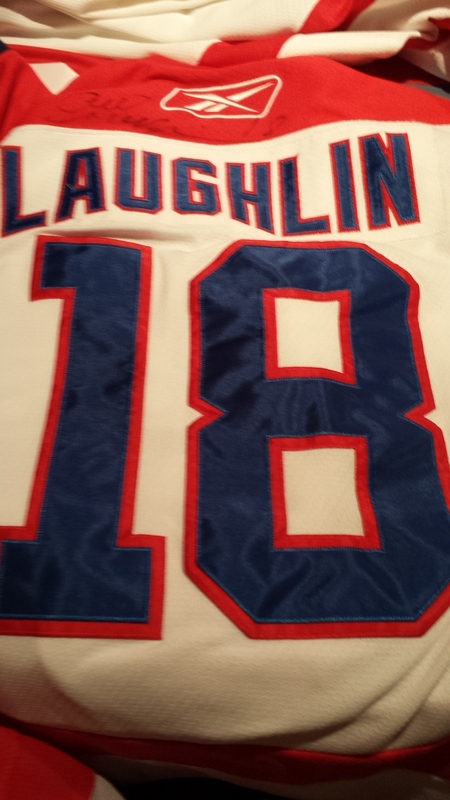 Now we have a Laich jersey and it’s showing some damage, too. What are we doing wrong? Erin: Hard to say. They’re pretty tough, but sometimes all it takes is a little accident and it can start to unravel. What sort of soap are you using? PB’s: We had been using “Hunter’s Helper” but that didn’t work out so well. Now we’re using something that has, like, oats in it or something. It’s supposed to a little more forgiving I guess. Erin: I’d stick with that for a while. What else? PB’s: Alright, we just picked up this other jersey, #43. It’s brand new, a little on the big size. 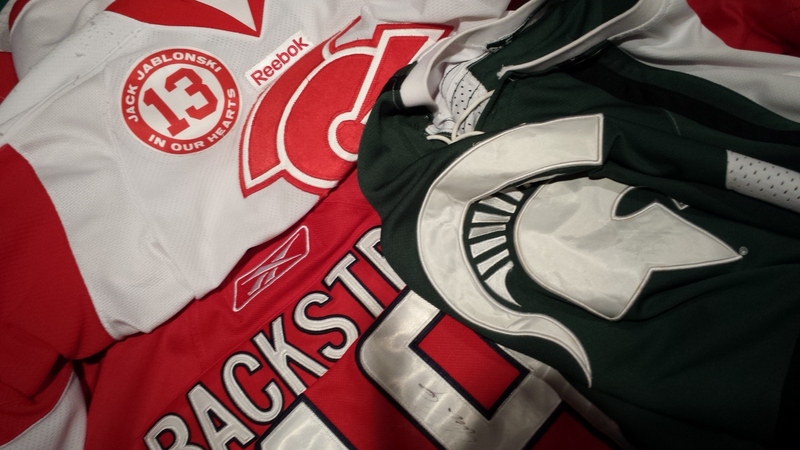 Trouble is, he keeps getting tangled up with the other jerseys in the closet. Any suggestions? Erin: Hmmm, Are you sure you wanna keep it? PB‘s: Heck yeah, I hope we have room for it. We’ll have to decide soon. Erin: What else can I help with? PB’s: One of our jerseys is covered in Semin. What do you suggest? Erin: Um… [Awkward silence]. Sir, I’m not sure I can help you with this. Anything else? PB’s: We’ve got this one jersey that we just adore, made in Sweden, we think. It’s not that old but last year it seemed like it started to fade just a bit. Any ideas? Erin: Have you tried untucking it? PB’s: We always wear them tucked. That seems like a silly idea. Erin: Sir, the instructions are very clear. Untucked. Anything else? PB’s: Do you take trade-ins? We have this #85…. This entry was posted in Washington Capitals and tagged Alexander Semin, Brooks Laich, Craig Laughlin, Do not bleach, Fab, Gentle cycle, Matthieu Perrault, Nicklas Backstrom, Please don't sue us Reebok, Tom Wilson, Tumble dry, We're very clean gays, Whirlpool, Woolite. Bookmark the permalink.